On August 8, 2018, Ambassador Dr. Yue Xiaoyong met with ICBC (Industrial and Commercial Bank of China) Financial Leasing Co. Ltd. Delegation headed by Mr. Yang Yuguo, Deputy CEO of the company. Ambassador Yue appreciated the effort of ICBC Leasing Ireland in supporting the Embassy of P.R.C. in Ireland. Mr. Yang briefed the Ambassador about the latest situation of financial leasing industry and the business development of ICBC Financial Leasing Co. Ltd.. They also exchanged views on current international economic and financial situation. By the end of 2017, ICBC Financial Leasing Co. Ltd. with its 609 aircraft ranked No. 1 in China and the 6th in the world in terms of fleet assets. 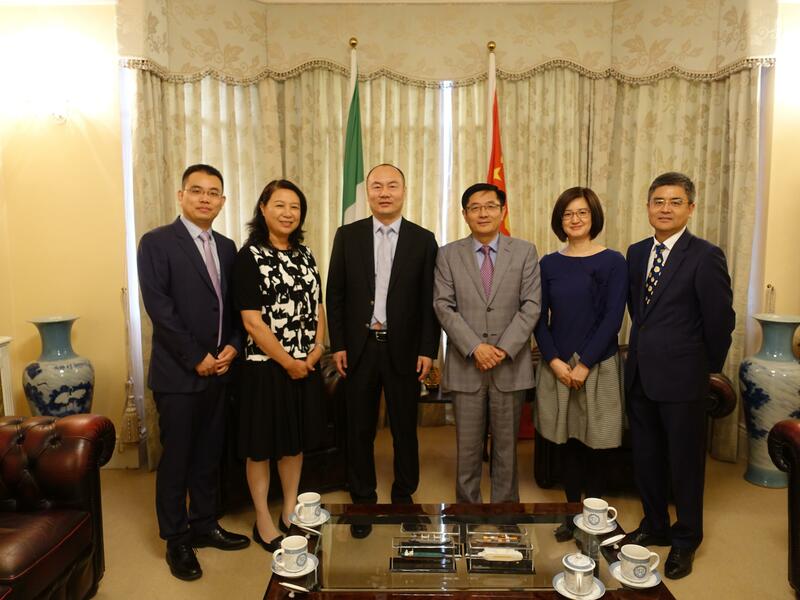 Also present were Ms. Xue He, Commercial Counselor, Mr. Xu Wei, General Manager of ICBC Leasing Ireland.